Hordes of students dressed in identical black suits and white shirts make the rounds of seminars, tests and interviews. Even as jobs outnumber applicants, these “Agent Smiths” still fight it out for coveted positions at big-name companies, while leaving smaller employers out in the cold. “Popular firms in industries like finance have seven applicants for one job. For us, we have seven competitors going after one candidate,” said Shuto Kuriyama, who works in human resources at regional furniture chain Shimachu Co. 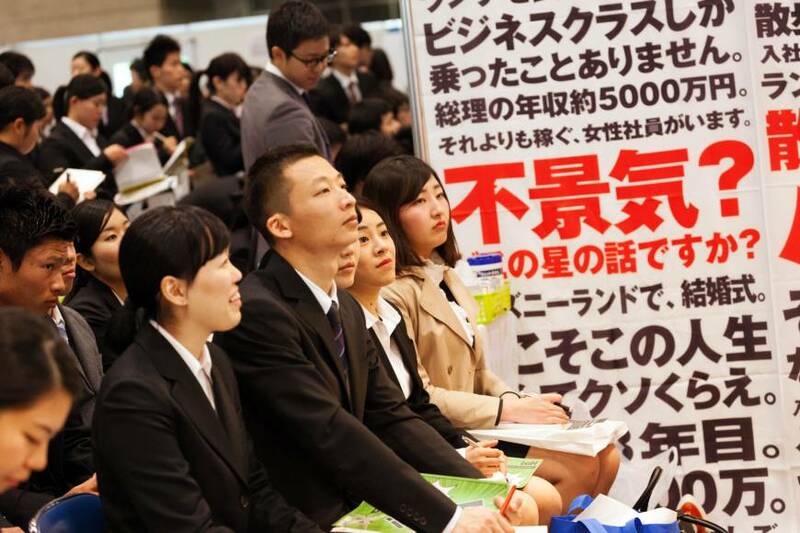 He was trying to attract students to the company’s presentation at a graduate recruitment fair in Chiba this month, while nearby booths for big-name firms were heaving with job-seekers. The low birthrate and slowly recovering economy are keeping Japan’s job-to-applicant ratio at a 25-year high, with the figure at 1.43 for January. In Tokyo, there are more than two jobs for every applicant. Small companies are the worst hit by the shortage of workers, but even some better-known employers are gradually changing their rigid hiring and employment practices — and some are beginning to consider foreigners. With one of the lowest unemployment rates in the developed world, Japan stands in contrast with Europe and the U.S., where a lack of good jobs has fueled support for politicians who want to crack down on free trade and immigration. 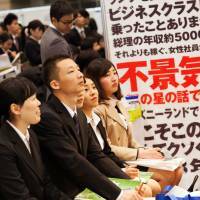 Only 3 percent of Japanese are out of work, compared with 9.6 percent in the euro region and 4.7 percent in the U.S., the latest figures show. Looking for a job in Japan means not only buying a suit and fine-tuning a resume, but also learning the elaborate rituals of the nation’s business etiquette, including how to enter a room, bow and sit correctly, and the right levels of polite language to use when speaking to interviewers or clients. At present, big companies and elite students have exactly seven months to find one another. The hiring season for university juniors opened on March 1 and major firms will formalize their recruitment decisions by handing out certificates at ceremonies held on Oct. 1. Most major employers will only take on recruits in April immediately after graduation — there are no post-college “gap years” and few second chances. Polls of the most popular employers among students generally find major banks, trading and insurance companies, travel agents and airlines among the top 10. While large employers offer starting salaries that differ little from their smaller counterparts, the steeper pay trajectory — at least for men — means a foot in the door and promises a far higher midlife income for those who stay the course. Some also offer benefits like company-subsidized accommodations or resort vacations. Michiyoshi Aoki, 22, who was among the 31,000 students at the recruitment fair, said his job search won’t include small companies. He already has his sights set on the big names in life insurance and automobiles, including Toyota Motor Corp., Nissan Motor Co. and Honda Motor Co.
With a market even tighter than before the global financial crisis, large companies are beginning to loosen their hiring practices, and midcareer recruitment is growing. Big employers are widening their nets to make sure they get the best recruits, according to Masanori Ishida, senior managing director in sales and marketing at Pasona Group Inc., a temporary services and recruitment company. “Smaller companies have long accepted new recruits up to about three years after graduation,” Ishida said. “Now big companies are beginning to follow suit.” More inclusiveness, including for LGBT applicants, will gradually become the norm, he said. Food company Calbee Inc., for example, plans a new drive to recruit a handful of personnel this year who graduated as long as five years ago, in a bid to improve diversity. Trading company Mitsui & Co. is planning overnight camps in August to broaden the recruitment base to applicants who may be overseas earlier in the year. Hoshino Resorts Inc. is allowing students to answer questions by video for the first time to make it easier for them to apply from afar. “Japanese companies will have to improve their work environment or we won’t be able to attract people,” Daiwa Securities Group Inc. President Takashi Hibino told investors on Feb. 28. The company has already made changes to better enable women and older people to continue to work, Hibino added, but more must be done. Big companies are waking up to another untapped source of recruits: foreign students at Japanese universities. A job fair for overseas students held at Pasona’s Tokyo headquarters on March 10 attracted 32 companies — including all of the country’s major banks. “I want to work in Japan,” said Vietnamese student Tuyet Ngan, 26, dressed in a black skirt suit like her Japanese counterparts. She said she was looking for a job in food or shipping.